Robert Jones addresses the UI campus and community Wednesday morning. Once again, the University at Albany is saying goodbye to its president. Robert Jones announced his departure this week. it was revealed this week that Jones was stepping down to take a job at the University of Illinois, where he assumes the dual positions of Chancellor of the University of Illinois at Urbana-Champaign and Vice President of the University of Illinois System. The 65-year-old Jones headed UAlbany since January 2013. In a letter to the campus community Tuesday, Jones said the decision to move on presented one of the most difficult dilemmas he's faced in more than 37 years in higher education. Jones was introduced to the UI campus and community at a public event Wednesday morning. Jones, heard on WDWS Radio Champaign, is the first black chancellor at the 46,000-student Urbana-Champaign campus. "Over time, as chancellor of UIUC, you will grow to tolerate me, and some of you might even like me, just a little bit. But I think you all will grow to trust me." The Dawson, Georgia native has more than three decades of higher education leadership experience, as well as academic expertise spanning plant physiology and urban and international development. The search for a chancellor began in January with "dozens and dozens" of prospects, whittled down to four by the end of June. U of I president Tim Killeen (formerly vice chancellor for research at UAlbany) said he was "delighted" when Jones made the final four. "Robert is also an acclaimed researcher, an international authority on plant physiology, and he knows how these corn plants work inside, which I think is a helpful asset as well. And a fellow of the American Society of Agronomy and Crops Science Society of America. His achievements and character, I think we all agreed, check literally every box on our wishlist for a new permanent chancellor: academic and research experience, superior leadership and communication skills, and a Big Ten and a land grant background, all rooted in an unwavering commitment to integrity." 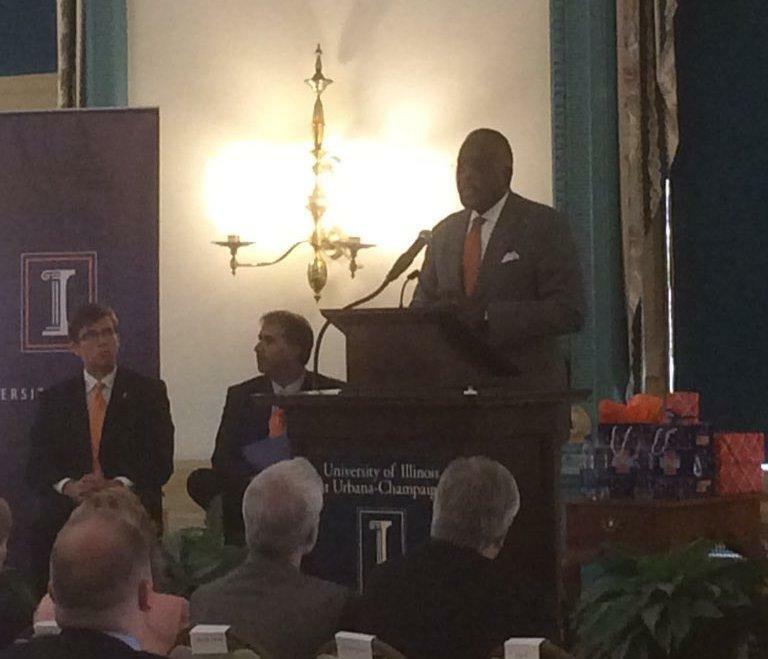 Jones told the UIUC community that his "dream job" presented "an awesome leadership opportunity." He shared plans to start his new job with a 100-day period of listening and asking questions rather than announcing grand plans for the school. Jones did note that he felt the public university needs to focus on affordability for low- and middle-income students. The cost of a four-year degree exceeds $100,000, and he believes public universities need to continue to be open to people from modest backgrounds like his own. "Everything I've done since the time I was standing in that cotton field in southwestern Georgia, looking at this handful of cotton and trying to figure out how this green plant can produce this white mass of material that somebody thinks has some value, (all I know is that it caused me to work harder than I should have been at 8 or 9 years old, that was the context I had for it) but that became the backdrop and the impetus for me to pursue science, because I knew, that notwithstanding the experience of being the son of a sharecropper, I knew that through education I had the opportunity to provide a better livelihood for myself, my family and future generations. And I feel very strongly that everything that I've done since that time has prepared me for this opportunity, and for this moment." Jones sounded very much in his element as he charmed the crowd, as if UAlbany were already a faded memory: "I haven't flown over this great landscape in quite some time and I had forgotten how beautiful section lines are. And as the plane descended to land at the airport, I had forgotten how beautiful those sections when covered with corn and soybeans of different shades of green, how actually beautiful the landscape is because of all of that." Jones said he was reminded of just how far one can see and how flat the land is across the midwest. "As a passionate cyclist and a downhill skier, my first thought was 'this is really a great job!' Cycling is gonna be a lot easier here, in fact, I told Lynn* I think I'll take that new trek i bought with a 27-speed back and get a 3-speed, 'cause I think I'll be okay! Skiing, not so much. I guess I'll still have to board a plane once or twice a year and fly out west someplace. But again, this is an amazing job opportunity and I look forward to engaging with each and every one of you to move the university forward." UI trustees voted unanimously to approve Jones' hiring on Thursday; he will take over in October at a salary of $649,000 a year. Jones' last day at UAlbany will be September 30. UAlbany did not make a spokesperson available to comment on the president’s departure. The college has had seven leaders over the past dozen years. The not-for-profit corporation that operates the historic Palace Theatre in Albany today presented its vision for a $65 million renovation and expansion project. Three UAlbany women involved in a CDTA bus attack in January were arraigned this morning in Albany Police Court.